Welcome to The Cherry On Top's, Traditional Tuesday. We were working on Christmas cards with scraps and up cycled cards from year's past, but last week's and this week's edition is all about tradtional scrapbooking with Simply Stories, Posh collection. I got a good taste of the collection at Tiny's Hobby in Kortrijk, Belgium, Pizza Box event. At Pizza Box events, ya pay one price and get a pizza box full of scrap goodies to scrap the day with. I barely finished two pages at the last event. We were all having such a great time singing, scrapping, laughing and munching on pizza for lunch. What's not to love about that, right?! I'm currently on vacation in Germany. I've always wanted to be here for Christmas. Bucket List item, checked off! I did bring some scrapbooking things along this time in hopes of finishing up at least a page or two with my left overs of the Pizza Box event as well as some mini pages from my Webster's Pages mini album, that I'm STILL yet to finish! Amazing as it is. To see more of this stunning album, click here. Above, I went with a Project Life kind of page, but I am the kind of scrapper who cringes at too much white space. Hehehe...I just had to embellish a bit further. These papers are just lovely. Use up those scraps of paper to add extra colour and interest to your pages. Layering gives your pages a much more polished look. It's also a great way to add contrast. Take note to the colours I used to back up whatever is on top of them. Take a gander at the weiner dog. That is a very light paper that he is on so I backed it up with a coordinating, dark colour so that the journal card stands out or contrasts from the background paper. The touch of gold bling in this collection is simply divine. I had to take it just a touch further by adding a few gold gems here and there. The dark blue spots will host two photos that will be framed in white. These simple word strips were a nice extra in the collection. They kept them fairly general so you can find more than enough of them to use on your pages. That's it for today. I'm undecided for next week. 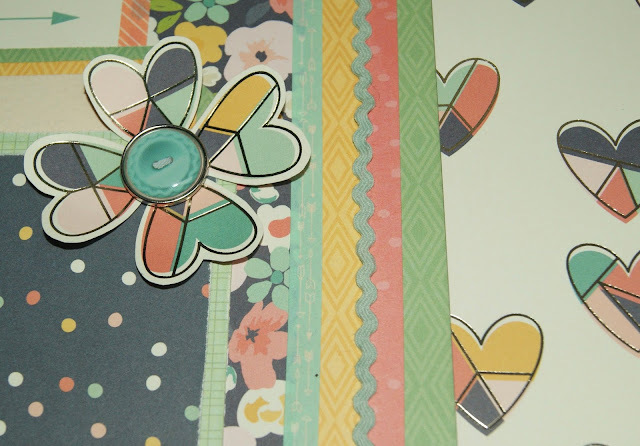 I'm planning on more pretty Webster's Pages, but I really want to start my cards for the year box, too! I guess it wil be a surpise. Until then, happy scrapping! Welcome to The Cherry on Top and Happy Holidays, to you! I'm working feverishly to get ahead. So by the time you are reading this, I'm sipping on some mulled wine and spending quality time with my family. I hope you'll be doing the same! I've got some lovely, printable gift tags for our hybrid Saturday feature as well as a few other current freebies you'll find around DigiLand. Keep reading to get the link for the tags, see some holiday goodies in our new shop as well as some freebies you may have missed. Another exciting thing happening at The Cherry, we will soon be offering page files for our templates! I used our Sleigh Bells Ring collection for our tags, today. It's a good look at our design papers in the collection. This was yesterday's gift for you. Hop over and get while the links are still live. This is a template I designed. 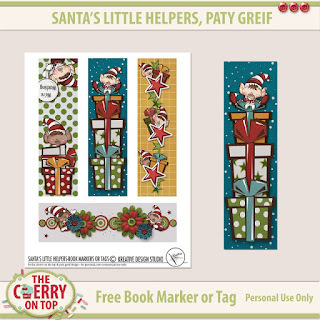 It's free when you subscribe to Paty Greif Digital Designer's newsletter. She's got TWO other gorgeous freebies for you. This may no longer be available from Paty. 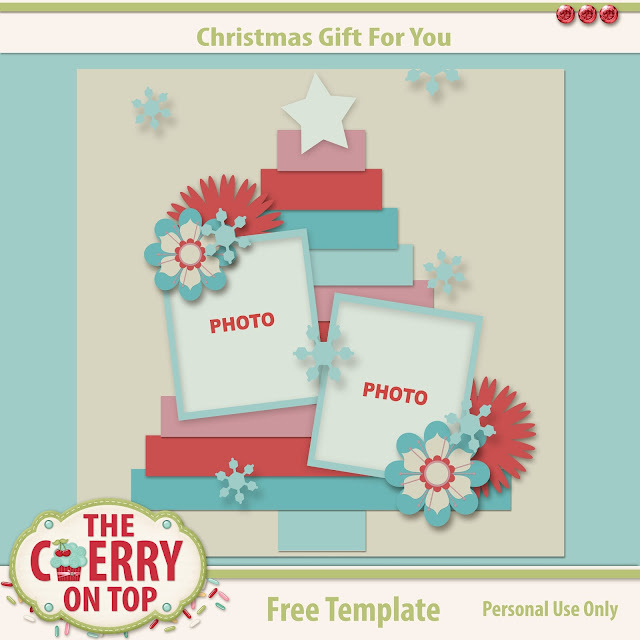 If you're in our group on FB, then you might already have this free template in your downloads. For those lovely ladies that showed off their layouts using the template, they received another template. If you don't want to miss out on the free stuff, then join our group, today. We have a lot of fun over there and you will, too. These are the newest templates in the shop. You Rock! 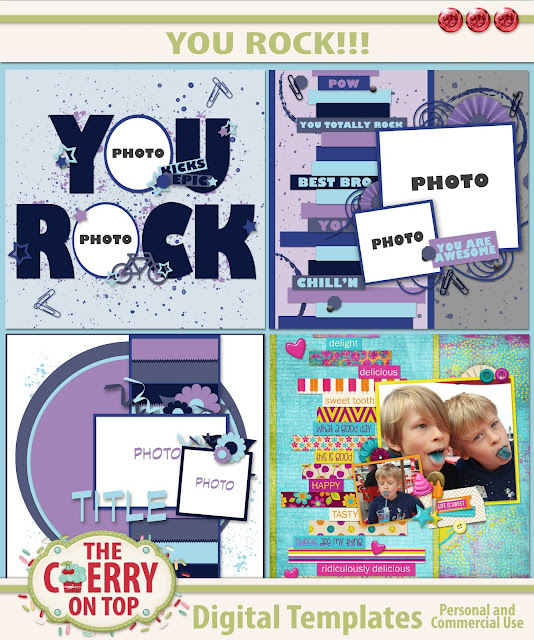 templates will make a super edition to your scrappy stash for those rock'n photos of yours. Got some shots with attitude? Well, you'll need some templates to match! THREE templates or just 1.79! These are our FREE December goodies. I'll be taking down the link at the end of the month. So grab them while you can. Keep reading to see more from this collection. I have some cute clusters with all of your favourite characters from Sleigh Bells Ring. Speaking of characters, here was the FREE quick page. It is also NO LONGER available. 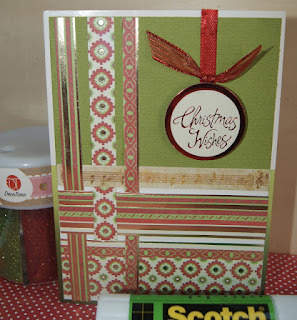 I used our Revel In Ribbons templates to scrap it up. 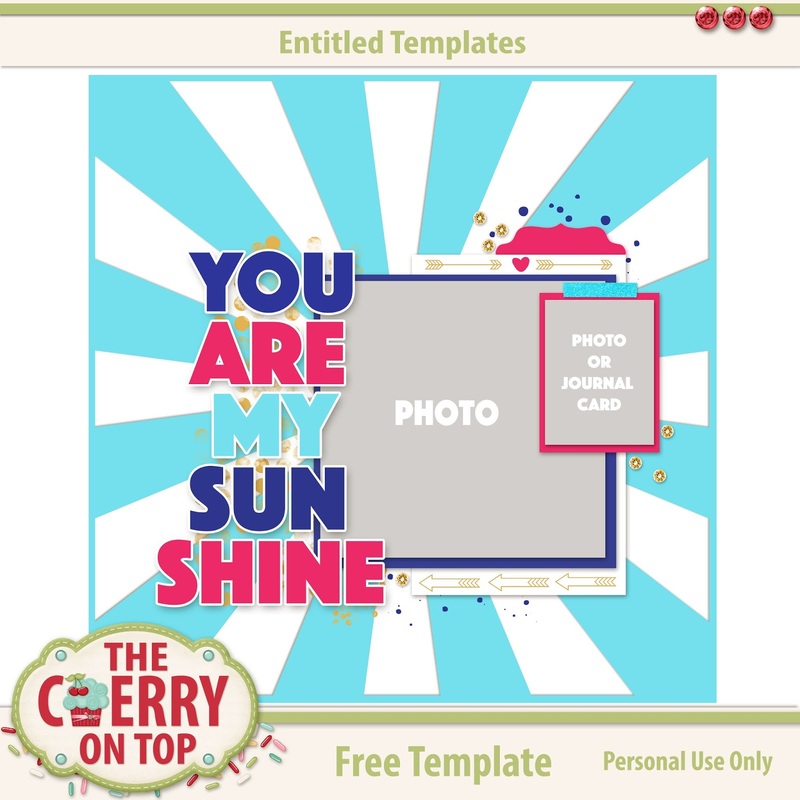 You are going to love those templates! They are priced to sell, so treat yourself! This is a close up of Sleigh Bells Ring. I'd like for everyone to get a feel for our goodies in the shop. If you haven't visited, allow me to invite you. You won't find better prices with this kind of quality. HERE is the link for the free tags. I hope you have the merriest of times this weekend. Thanks so much for making The Cherry a part of it! Happy Holidays to you and yours from The Cherry On Top! Merry Christmas from The Cherry On Top! It's finally coming! Yay! I've been dreading it for months and looking for to it for a few days, now. Hehehe...After all of this crazy work leading up to the big day, it's time to take a break and enjoy a few days rest with family and friends, right? I hope you will do the same. I've got another nifty free template for our totally awesome readers. I cannot believe how far The Cherry has come and I totally have YOU to thank. Thank you so much for making The Cherry a regular part of your busy schedules. Thank you for checking in our weekly projects, inspirations and freebies. Thank you for checking out and hanging out on our other social spots like Pinterest and Facebook. Our newish group, is coming along so, so well! We get new members nearly everyday. The chatter over there is just amazing. As is the lovely comments you are making on the pretty pages members are sharing. I LOVE that! Nothing better than a pat on the back for a job well done. Thanks so, so much! The best part is all of the visits, favouriting and purchases we've had so far in our new shop, Kreative Design Studio. I'm in awe at how well things are going over there! My appreciation for this cannot be measured. Thank you!!! If this is your first time here, welcome! This blog is FULL of FREE stuff. Grab a cup of jo, sit back and fill up your digital stash! Here is your nifty gifty. We'd love to see what you do with our freebies. Show them off in our group or leave a link in the comments. It's perfectly fine if it's a link to a blog. We'd love that! 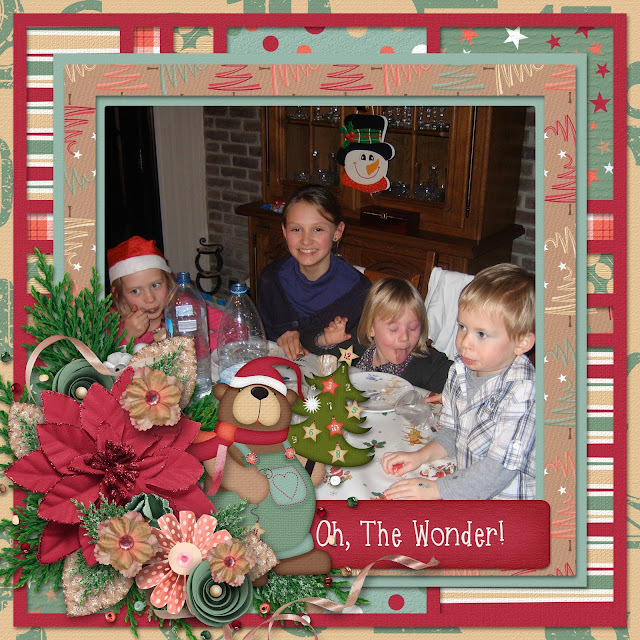 I hope, from the bottom of my heart that your Christmas is the merriest and that your New Year is full of fun, prosperity and a lot of scrapbooking! Hehehe...Ya know I couldn't resist! I wanted this so bad for last week, but it ended up being much more difficult than I thought. Hehehe...Then we were left with nothing. My apologies, but we are back with the bunting and I'm pretty sure you're going to love it. 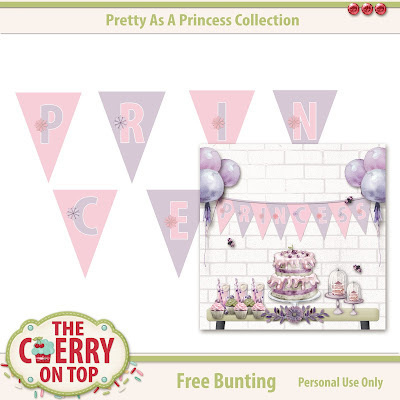 Keep reading to see our free, Pretty As A Princess bunting and much more. 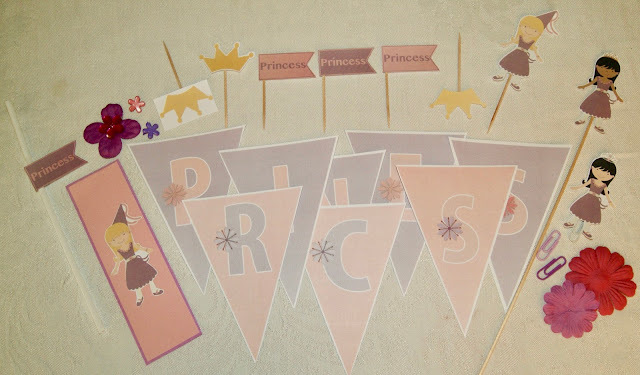 If you got our Princess toppers from the shop, then you can see all of the different things you can do with them, here. Above you'll see a few ways to make party favours. 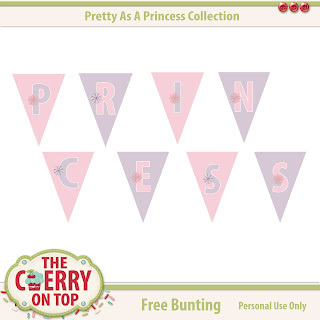 The easiest is attaching the crown, flag or princess to a paper clip. I'd laminate it for rigidity, but printing it on good card stock could do the trick, too. 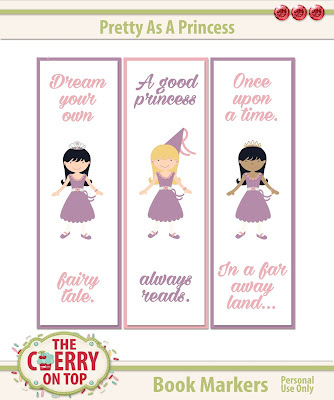 Grab some coordinating papers, cut out your favourite princess and layer them up to make a book maker like the one you see. You could just buy ours for just .99 cents and save even more time! I had all of these lovely goodies displayed and ready to take pictures when my battery died. BUAH! By the time it was charged up, the lighting was really weird. Hence, the orangish glow. Man! 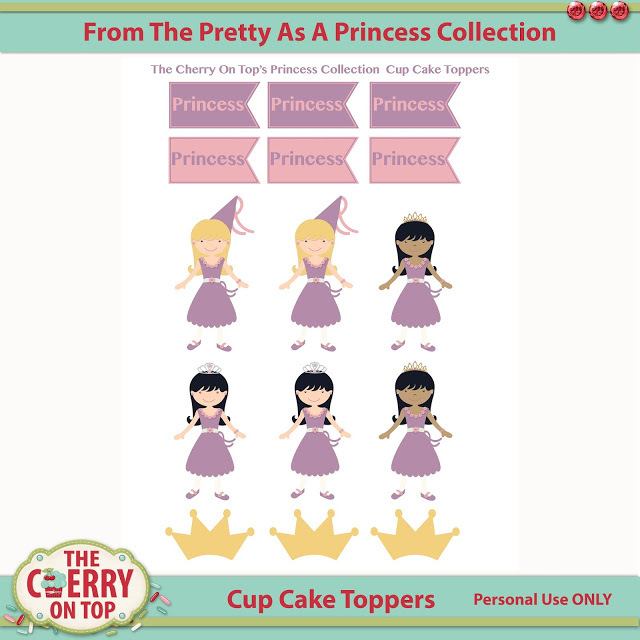 Check out all of the different ways you can use the toppers. 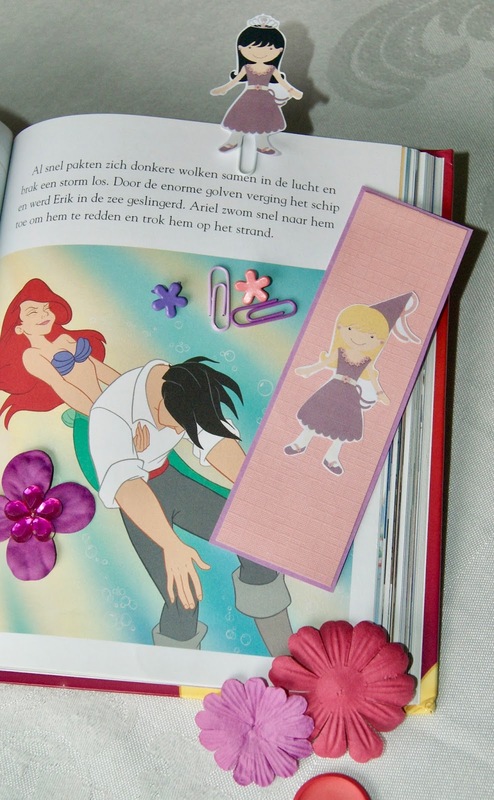 Bookmarkers, on straws, on a large skewer as a puppet, on the paper clip (it would look even more fancy glue dotted to a flower and then the clip), tooth picks for in cup cakes or other treats, cut directly on the lines, leave a tiny edge of white to look like a sticker (my favourite) or if you are really in a hurry, just cut a square around the object, like I did for the crown, top left. Not bad, right? 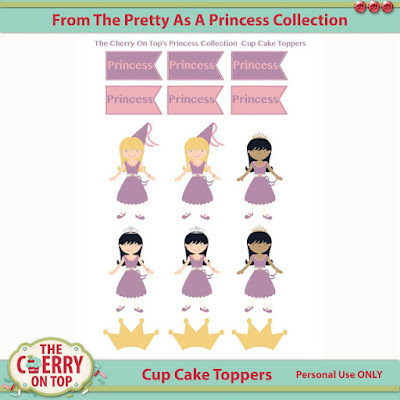 These are the toppers you can purchase in our new shop, Kreative Design Studio. They are just .79 cents. I'm getting a bit of flack for my low prices, but I just want everyone to be able to use Cherry goodies. I realise that folks might think the quality is low in relation to the price, but if you know us, we care greatly about quality and save our products at 300 dpi. That's the best! If you're not sure, visit some other entries, download a free printable, print on your best quality setting and paper with a slight gloss or sticker paper and you'll see we are about quality. This is no longer free. It's now available in the shop. The link is still live for this super cute, free book marker. Get it while you can or if you like get the entire sheet of book markers in our shop. You can use them as borders for your paper projects, too. I just LOVE our December freebies. 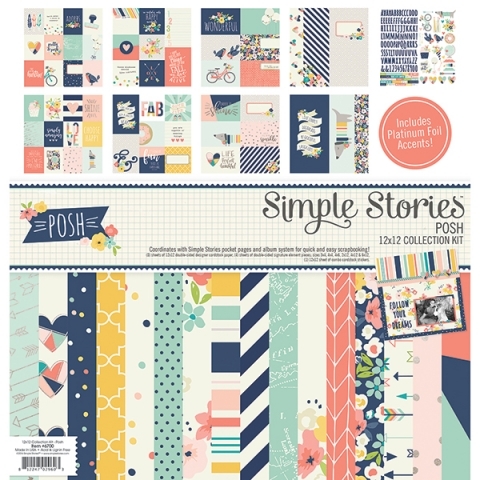 Yes, that means there are ELEVEN more FREE sheets throughout the blog. Use our search box at the top, right on the blog and type in "planner". That's it for today's hybrid. Sorry about missing out last weekend. I hope you browse through our new shop and "favourite" it so you don't miss out when we put new things in. Of course, following us here, on Pinterest and Facebook will ensure you continuous updates and a LOT of free stuff, too. Fridays are all about freebies. Check out all of the different freebies we have for you, today. 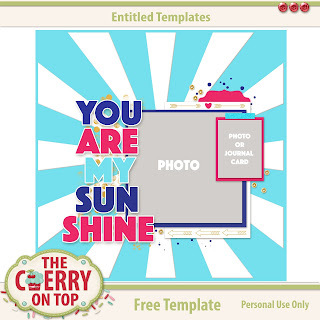 You Are My Sunshine is from a 4 template series, Entitlement Templates. You missed this as a freebie, but you can still get it in our shop. If ya don't want to miss out on the freebies, then follow us here and on our social spots. 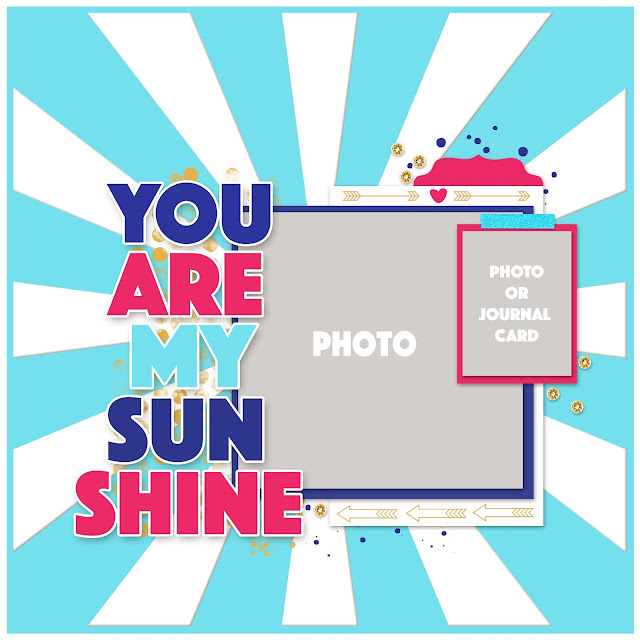 Check out our lovely inspiration and see what other freebies there are around DigiLand as well as a peek at tomorrows freebie. I know I may not really have a "style". I just love EVERYTHING. Hehehe...I can't commit to a style or palette. It's the rebel scrapper in me. No rules, please. Hehehehe... 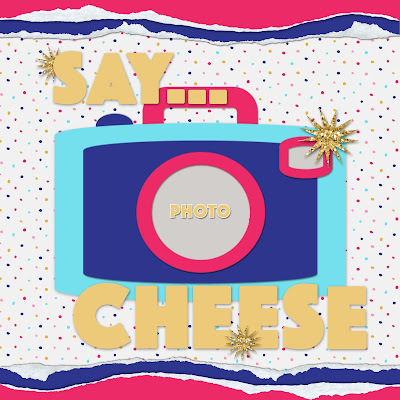 I love the bold colours and large graphics with a sweet emphasis on your photos. Here's another template from the Entitlement series and there will be two more. They are still in the works, but will be ready very soon. 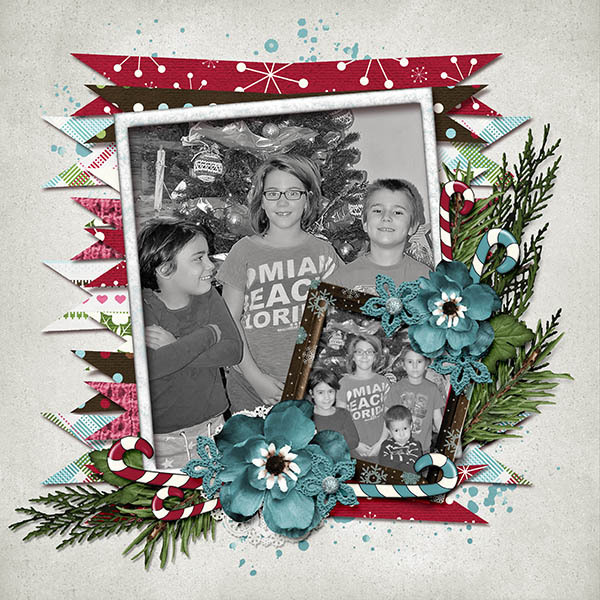 My gal Melissa made this beautiful layout using Little Rad Trio's kit, Christmas Memories. 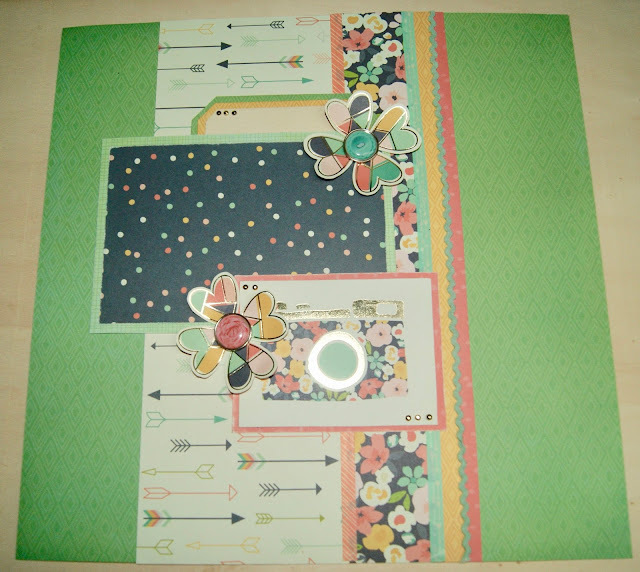 This template is from Heartstrings Scrap Art. Isn't it just fabulous? I used our Sleigh Bells Ring Collection with it. You can see the collection, below. It is finally in the shop and for under 2 Euros! There are 60 elements and 15 papers as well as an alpha and numbers. I pulled out the star elements to show them off a bit. I've also stuffed in a pretty free overlay when you purchase the elements. The papers are just .99 cents and so are the embellishments. Not bad for around 2 Euros, right? If templates are your thing. 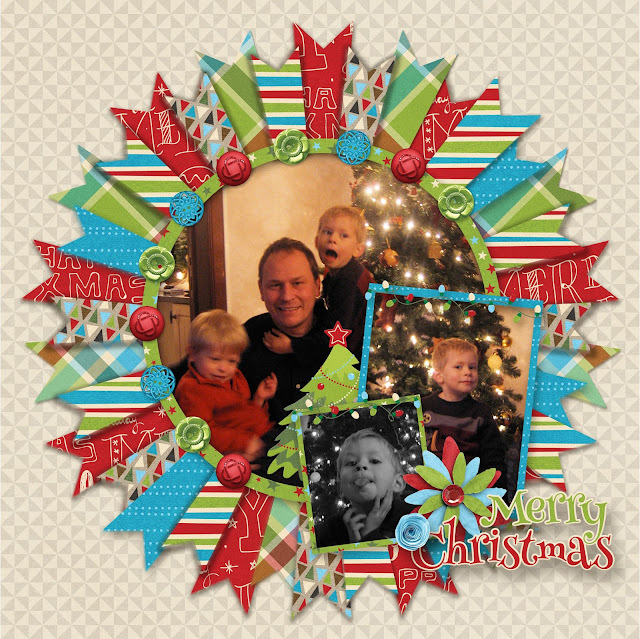 Check out our Simply Circles templates. You get three templates in png, psd and tif format for just 1.79. 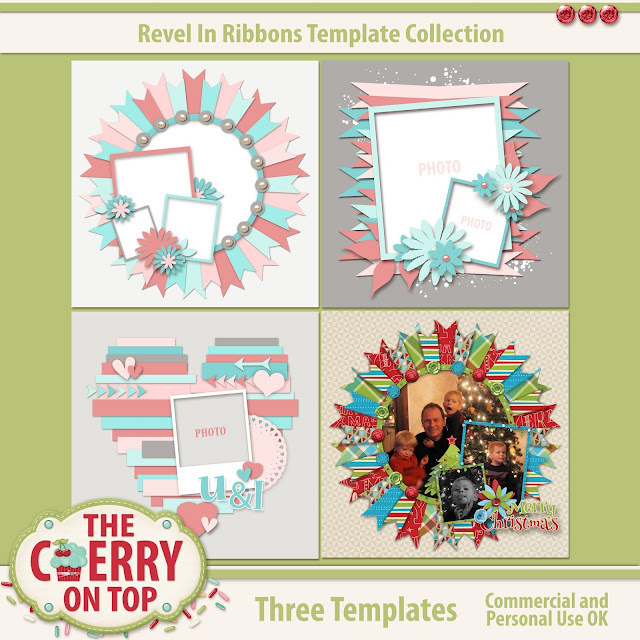 These are our newest templates in the shop, Revel In Ribbons. Take a look at what we've done with them. They are also just 1.79 for three templates. Magalie scrapped up this absolutely gorgeous layout using Ragina Falango's kit, Little Divine. 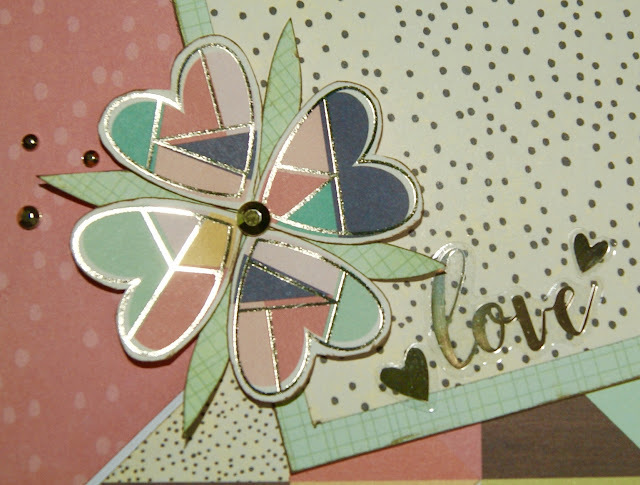 Dana from Made By Keuntje designed this lovely layout using her newest kit, Cold Feet Season. 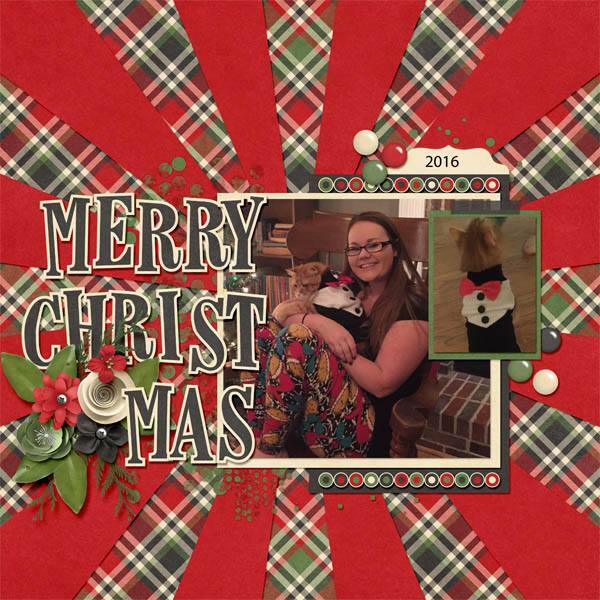 This is my layout using Elf Me from JoCee Designs. I won it on her Facebook Page. Getting into these groups is a great way to earn free digital scrapbooking stuff. 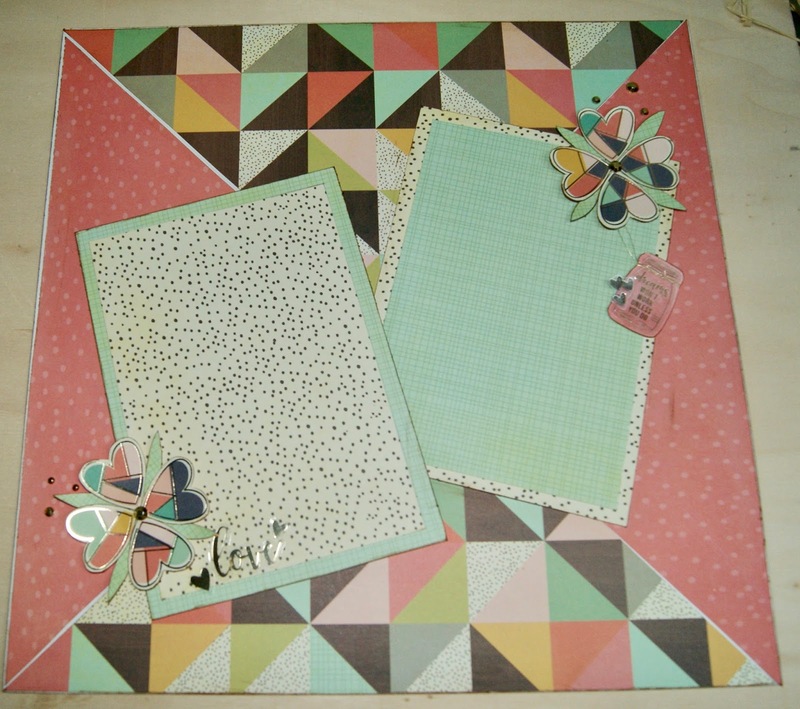 This is also my layout using a template from Lissy Kay Designs and a FREE kit from Throwing Some Scraps Around, which you can get when you join her group. 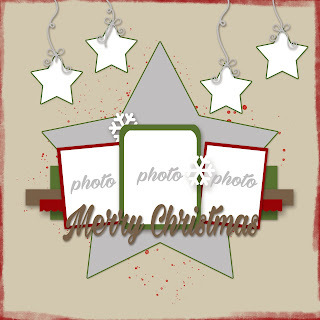 This is also a free template from MagsGraphics and her kit, Home For Christmas. 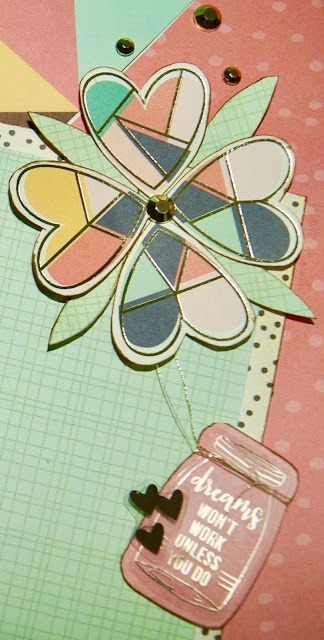 This is a peek at tomorrow's freebie! I hope you enjoyed all of our inspiration and the freebies. You can get free stuff nearly every single day when you follow us here, on Pinterest and our page. If you'd like to share your designs, join our group where we get into chatter and I give exclusive freebies. I had the best day ever on Saturday! I went to another Pizza Box Scrapbooking event at Tiny's Hobby in Kortrijk, Belgium. In this Pizza Box, we got Simple Stories, Posh collection. Well, some stuff from the collection. It sure is a super, super collection. I love the colours and the lack of a theme. Keep reading for more inspiration and a few tips. The morning of the event, I hit up Pinterest and drew some sloppy sketches from layouts I liked. Although Tiny's always provides a lot of pages, I have this thing with scrapping the exact same thing as my neighbour. Hehehe...I do realise that is a great idea for those who don't even know where to get started. The ladies are always there to help, too. There was a paper with these pretty hearts. I left a sticker type of edging on them and placed them to form a flower. Give your pedals a little push forward or back for added dimension and depth on your page. Layering is also a great way to add colour, texture, softening a page and adding pop and contrast to make particular aspects of your page stand out more than others. I finished off my flower with a huge button brad I bought at the Action for next to nothing. I kept bending the prongs until they fell off and used a thick glue dot to adhere. The layered up tag on the above layout will provide an excellent spot for a title. Here's my second page. Reverse layering for extra interest and more of the same neat shaped flowers so I could place these two pages side by side for a posh, coordinating double page layout. This time I added some leaves under the flower. I just drew this shape and traced it for all of the others so they were all basically the same. Then I inked around the edges to make them contrast more against the background. These clear stickers were really nice. I backed it up with some coordinating scraps I had, inked around the edges again for a cohesive look with the rest of the page, added this tiny, fine gold cord because this entire collection seems a bit fine and dainty and then topped off the cluster with these hearts. I took a tiny glue dot and rolled it up so that hearts would be higher than the mason jar, lending more depth to my page AND you don't see the adhesive. I just love all of the bling. So, I added a bit more with my own bling from Action. A bit of pretty, gold script from the collection and coordinating hearts to polish it up. This is what the basic kit looks like. Sweet, eh?! Here are a few of our other traditional projects: They are linked. I LOVE this project. I've got a FULL TUTORIAL and a FREE TEMPLATE for you. 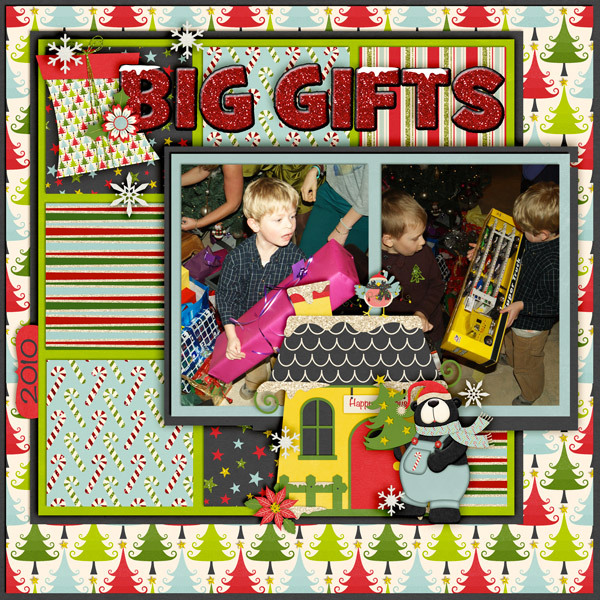 Maybe you could still use a gift idea? This project was really fun, easy and fast. There's a full tutorial and another free template so you can scrap this up, too. 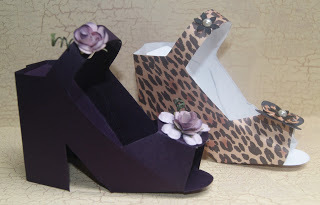 Needing a party favour holder or just LOVE shoes? Try out this project. I have a tutorial and a link for the free template. We had several weeks worth of card ideas. Here was one of my favourites. 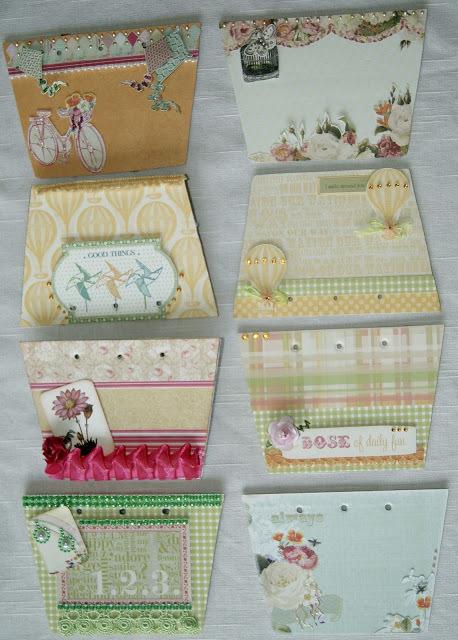 Scrap fast and economically with the stash you already have and by all means, save those cards. Graphic 45 is one of my favourite paper suppliers. Check out what I did with a cereal box and just a few scraps of paper. If you like what you see, Follow us here, on Pinterest and on Facebook. I've also got a group if you want to show off your projects there, too. 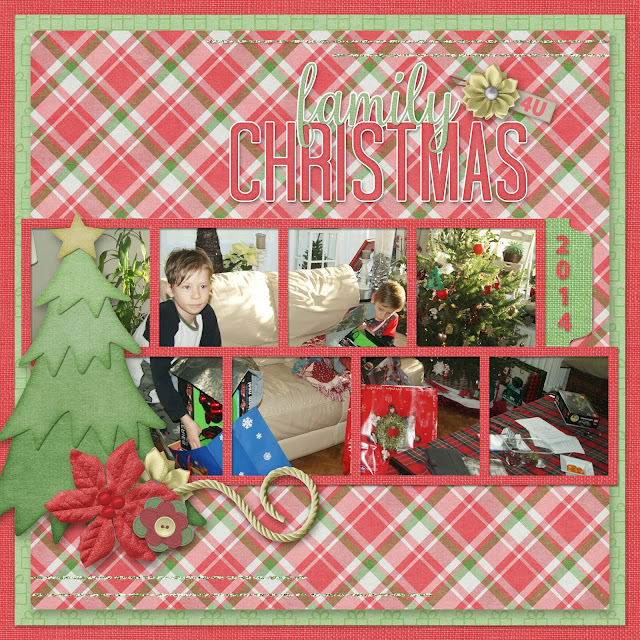 I've got a pretty awesome, free quick page for you designed with my free, kit from last year. It's been quality checked and I've added new papers and pieces. You can find it in our brand new shop, Kreative Design Studio very soon. 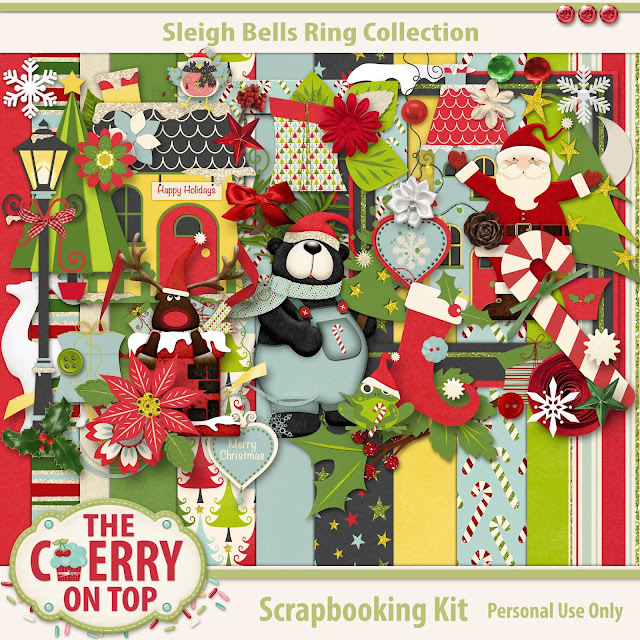 I've got inspiration, new templates, an in depth look at the Sleigh Bells Ring Collection, a gift idea and a couple of links for more free stuff. 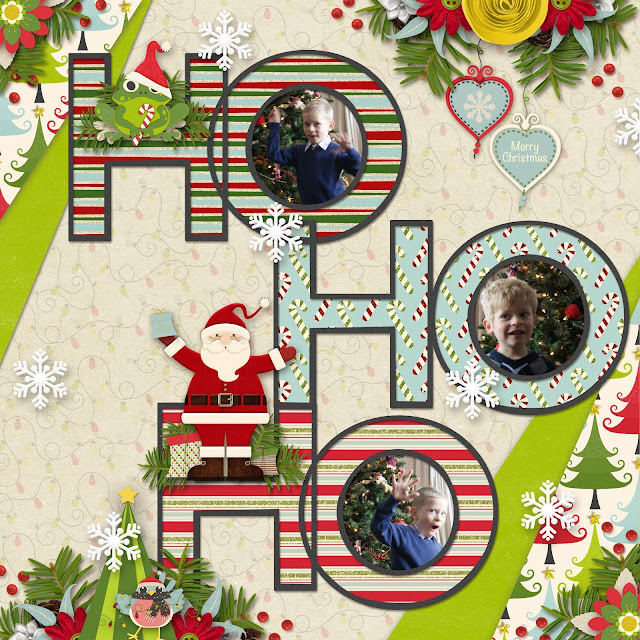 I scrapped up my oldest with our new collection and our new templates in the Revel In Ribbons Series. Scroll on to see more templates in the series. I just love this retro colour palette in Sleigh Bells Ring and that bear. The characters from GS Creations are so cute. Mommyish provided the lovely effects I used to get a feeling of texture to make the collection feel warm and cozy. How about these clusters? They are already in the shop and ready for you to use. 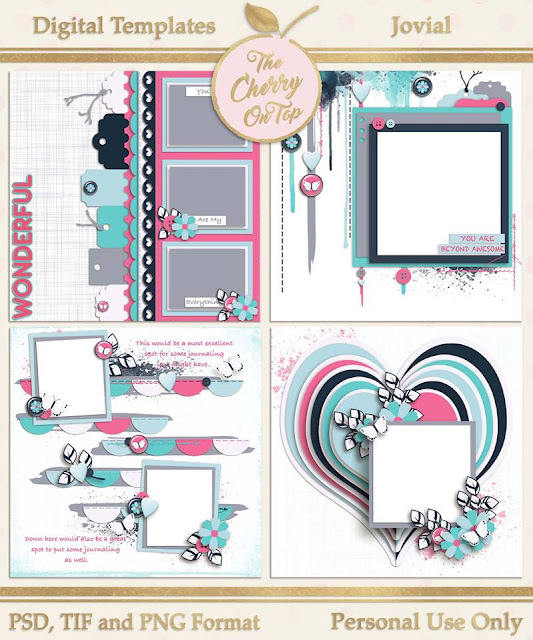 Can you find the one I used in this layout with Heartstrings Scrap Art's template? Don't shy away from cutting out part of a cluster. That silly, silly boy! 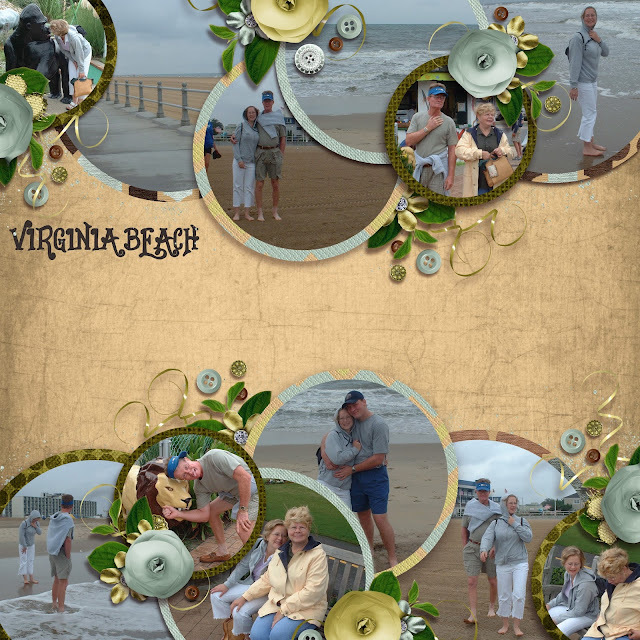 Making Memories templates are so much fun and easy to use. They help you scrap beautifully and fast. This is what is going to be made available soon, in our shop. I'm just waiting on the quality control ok. It shouldn't be long and I'm hoping for the weekend. There are 15 papers and nearly 60 elements as well as the red, glittery alphabet sheet. I designed this layout last year and offered the template for free. The link is still live if you missed it. Click on the image above or below to get the free template. Here is another free template on the blog. I got mega creative last year with the gifts for my nieces. They wanted cash so I bought a few fun, very inexpensive things and put 10 euros in as well. I scraped up 5 digital pages and printed them to fit perfectly in this up cycled, clear box. 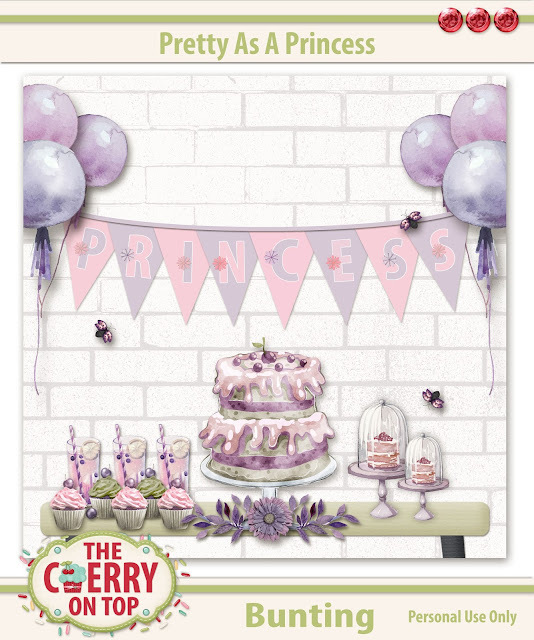 I added a luxurious bow and some nifty tags with a kit from Paty Greif. See the entire, in depth tutorial by clicking on the image. There are also more freebies to be found there! 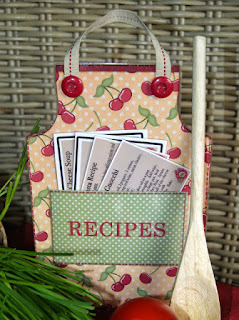 Here, you will find another link with a free tag template so you can make your own tags. 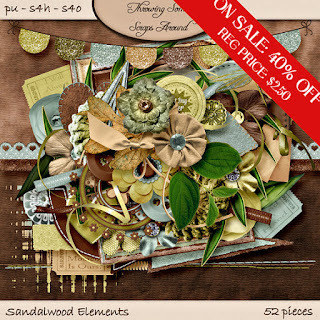 I thought I'd show off our other new templates in the shop along with this gorgeous kit from Throwing Some Scraps Around, Sandalwood. She's got a free quick page for her fans, too. Jodi often has sweet freebies on her blog and her shop is full of beautiful creations at Cherry prices. Fond memories of one of my last trips in the States with my parents. I haven't seen them in years. 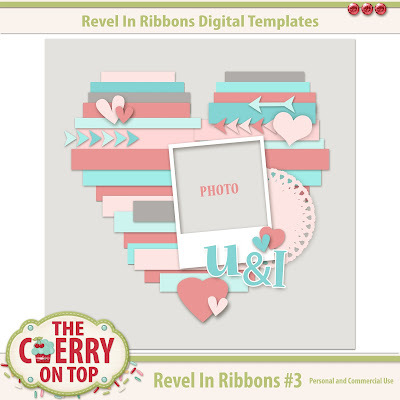 Here is another template in the Revel In Ribbons Series. I love this one! This is no longer free. Find the collection in our shop, Kreative Design Studio. If you have already visited there, thanks so much. We appreciate your business. We are keeping our prices rock bottom so that everyone can get an opportunity to scrap with them. So far, all of The Cherry's goodies are under $2!!! I hope you have a super scrappy weekend! Thanks so much for checking out The Cherry!